The race was coming to an end and I had managed to stay neck in neck with Lloyd Taylor all the way to the end. Only 20 yards separated me from victory. 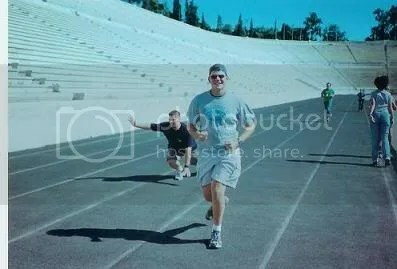 I couln’t believe I was actually running a race in the original Olympic Stadium in Athens Greece. I knew this was the biggest race of my life…maybe the only race of my life. Nonetheless, I had trained for this race earlier that morning. The cook back at the hotel had said “seconds” were available and I knew there wasn’t much left. I sprinted from my table to see if I could get my hands on the last cinnimon role. I won the race to the breakfast pastry, now all I had to do was beat Lloyd and I would win the gold. 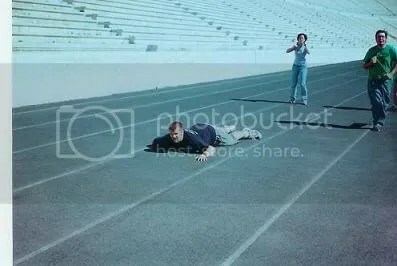 There was only 10 yards left and I was pulling ahead of Lloyd, then all of a sudden something deep down within me began to churn. I didn’t know what it was. As I began to think of my cross-training in preparation for the race, it became clear…the cinnimon role would rise again. I didn’t know what to do. I was going down. All my hopes of winning were flashing before my eyes as I fell to the ground. I reached my hand out to break my fall and glanced up to see Lloyd. I remembered he ate a banana and a handful of grapes that morning. Why did the greek woman with the name I couldn’t pronounce have to make such great pastries? Why did I not eat any fruit with my spiral of doughy goodness? Why couldn’t I have been sitting a little farther away from the buffet to get some more training in before the big race. It was all over. The crowd hushed, the flashing of cameras momentarily stopped. The bystanders gasped in amazment. Everyone had such high hopes of me pulling through. Now, they would cheer for someone else. Now they would never believe I could actually do it. Now they wouldnt let me eat any more cinnimon roles. I laid there…thinking…thinking…Who cares about a stupid race anyway? 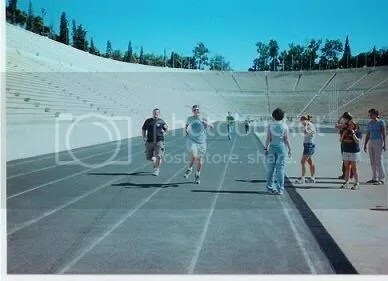 Posted on August 18, 2004, in Uncategorized and tagged Uncategorized. Bookmark the permalink. 1 Comment. Hope you’re well and enjoying Abilene!